Faced with the challenge of moving the mail quickly, the postal service looked to trains, automobiles, airplanes, and buses to deliver the mail, all of which are the focus of the museum's 90-foot-high Atrium gallery. Mail by Rail: After the Civil War, postal officials began to take advantage of railway trains for moving and sorting the mail. Sorting the mail while it was being carried between towns was a revolutionary approach to mail delivery, involving generations of devoted postal employees who worked as railway mail clerks. Owney: Mascot of the Railway Mail Service Owney was a stray mutt who wandered into the Albany, New York, post office in 1888. He began to ride with the bags on trains across the state—and then the country. In 1895 Owney traveled with mailbags on steamships to Asia and across Europe before returning to Albany. He was beloved by Railway Mail Service clerks, who adopted him as their unofficial mascot. Networking a Nation: Star Route Service: Some of the most ambitious movers of the mail were not railway mail clerks, aviators, or even postal employees, but were Star Route contractors. Star Routes were established in 1845 when the Postal Service began hiring contractors to use the most appropriate and efficient methods of transportation to carry the mail. The name "Star Routes" came about because postal clerks became weary of writing "Celerity, Certainty, and Security" over and over again in the contract books and began using "***" instead. These routes have been covered by all modes of transportation from stagecoaches, trucks, and planes to less conventional means, such as dog sleds, showshoes, and bare feet. "Star Routes" were renamed "Highway Contract Routes" in 1970, but are still known by their original name today. On view are a 1850s Concord-style stagecoach and a full-size semi truck cab-cutaway. On the Road: Motorizing the Mail: This section discusses the evolution of mail vehicles starting with the first tests in 1899 to the present. With the introduction of Parcel Post Service in 1913, these vehicles brought millions of packages into the mail stream for the first time. Despite numerous challenges over the years, motorized mail has undergone numerous improvements to dramatically increase efficiency in delivering the mail. In the early 1980s, after years of study and testing, another generation of postal trucks was introduced—nicknamed Long Life Vehicles—which quickly became familiar sights in American neighborhoods. 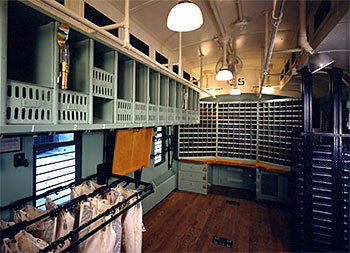 On view are a 1931 Model A Ford Parcel Post truck and a contemporary Long Life Vehicle mail truck. Airmail Service in America: Airmail service was the base from which America's commercial aviation industry developed. This section of the exhibition examines this critical role of the postal service and features the airmail service established in 1918 between New York, Philadelphia, and Washington, D.C., through the remarkable pioneering flights of pilots Torrey Webb, James Edgerton, H. Paul Culver, and George Boyle. On view are a 1911 Wiseman-Cooke biplane, a 1919 de Havilland DH-4B, and a 1936 Stinson Reliant SR-10.